Description: Kayano has a crush on basketball captain Yuichi, but when she tries to give him a love letter, school bully Takeru intercepts it. Of course, Kayano is mortified, and her despair deepens when her mother announces that she's engaged to Takeru's father, making the tormenter her brother. Takeru's father is the school principal, so he's used to getting everything he wants, and even the teachers are afraid of him. Takeru's a manipulator, arranging things so that he's on the basketball team along with Yuichi, and Kayano is the team manager, forced into proximity with both of them. Both boys pressure and confuse Kayano, and at times, it seems like she's less a character and more a prize. 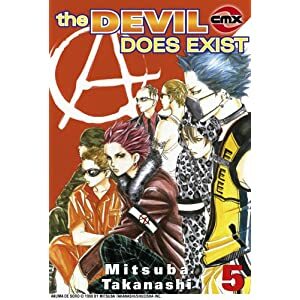 My thoughts: This is one of my favorite mangas of all time. I have all 11 books sitting on my shelf right beside me within easy reach, because sometimes I just like to pick it up and re-read it for fun. I love Kayano, who is your typical "shoujo" (that would be the "girly-teen-romance") manga character, but she's got a bit of inner strength to her that I really like, despite her first appearances at "weakness." And don't even get me started on Takeru, who to this day remains one of my favorite guys of all time. Love-love-love Takeru. He's just perfect in every way. There is depth to these characters, and a great storyline with a twisty plot that will leave you flipping pages until 3:00 A.M.... Even if you've read the books more than once! That really is one of the best manga's! Have you ever watched the Taiwan drama that was adapted from it? That's actually how I found out about the manga. Oh my gosh, there's a Taiwanese drama based on the manga?! I haven't seen it, but now I absolutely HAVE TO. I take it that it's good... THANK YOU for the recommendation!! !